This was one of those unintentional haul weekends. 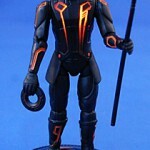 Doing the rounds on Saturday rendered only the marked down 4" Tron Legacy figures. Sunday, on a whim and in a desire to "get out of the house," I went out to visit a friend who just happens to live in a store-laden area. Was I visiting the friend or the stores? You decide. Regardless, three Targets, two Toys R Us's and one Walmart later I spent a lot of money on some stuff I was very excited to add to the collection and some I wasn't. Ooooh the obsessive compulsive buying - the bane of all Completists. This a second figural purchase for me on this guy. I'm a dyed-in-the-wool armybuilder and this guy is mucho primo. 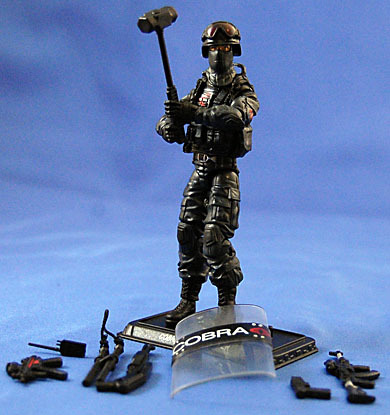 I just wish he didn't have the Cobra logo on his chest, then he could be a generic SWAT dude. Accessories, accessories, accessories, and that's even before you get to the accessories! Not all of them are that useful or desirable, but all are cool and several are awesome. This is a figure that should be heavypacked but either isn't or everyone is building battles with him because this is only the second one I've found and ended up having to pay $10 for him. Yes, technically he's worth that in comparison to what else is out, but it's a tough pill after the $8 I paid for some of the others this weekend. Look, this is just a cool damn figure. When I saw this at SDCC '10 I had a most-wanted figure. 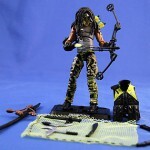 Great design, great weapon, great spin on the character and my god... toy money!!!! 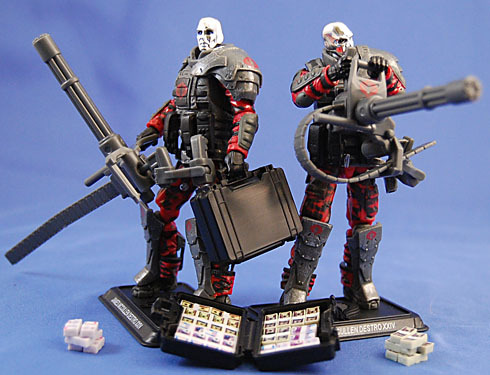 I bought two (and want to buy two more) because I want to do headswaps and use this figure as essentially Destro's bodyguard. I imagine him being flanked by them as exiting a helicopter or APC. Oh, and did I mention the frakkin' money!? 3¾" scale stacks of US Dollars and Euros!? It's worth buying two just to have more of that! So many diorama and photo opportunities. I only have two complaints with this figure: one, his money case doesn't stay closed - it snapped open, shooting money all over my couch (not an irregular weekend occurrence at the Casa de Rustin); two, I can not get him to two-hand hold the rail gun in a natural or comfortable pose. Oh my god. I had to debate a bit about getting this guy because I don't like his costume too much, but ultimately did, cause what the hey, and holy s**t he's awesome. Remember when Palisades died and it seemed like including a ridiculous volume of awesome accessories died with it? Well Joe Warden, lead Designer for G.I. Joe, said "eff that" and picked up the torch and ran with it tout suite! Sniper rifle, with scope and silencer, bullet cartridges and a case to hold the rifle and backpack for the rest - and even that's not all the accessories! In his review of the Destro above, Monkey Boy commented on the ridiculousness of how small the money accessories were, saying "what's next? A cigarette?" Well Low-Light basically delivers on that rhetorical aside - a single bullet is removable from the cartridge tray!!! I can't even fathom how something like that happens in this day and age! So, so, so amazing. Mr. 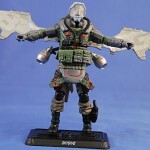 Warden puts the Joe in "Yo Joe" for making this figure... no, these figures... no, this whole line happen! Pretty much an impulse buy because he's new and I was buying others. 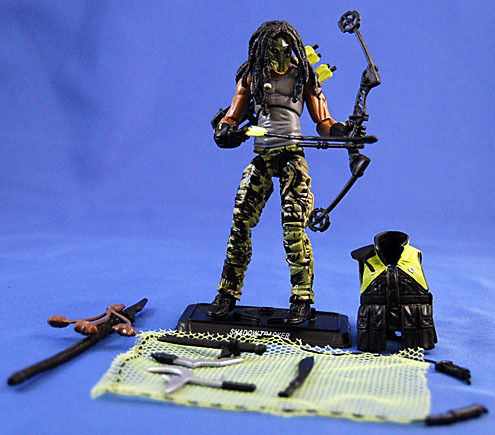 The neon green isn't a great choice, and I wish his mask was removable, but the bow is pretty cool. Not much more to it than that. Honestly looks cooler than he actually is. The rubber helmet is fairly bulky so that added to the big collar mean minimal head movement at best. The winged-pack is pretty cool, but there is not way to close the wings with the jets or bombs plugged into the little arms, so I'm not totally clear about orientation. 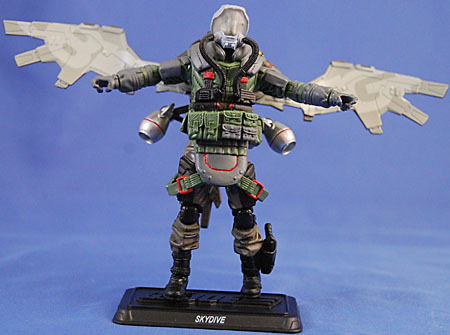 Still, though, with wings deployed is a pretty cool look and a nice addition to the air brigade of the collection. 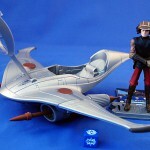 Hasbro - SW: Clone Wars: Anakin & Fighter??? This was one of the first series in the new Star Wars Mini-Rigs, but with the over-$15 pricetag I have put off buying these. This fighter, though, was one of my favorites from the first reveal, so I was bummed I missed out on it. It appears to be back in rotation now so I went ahead and got it. 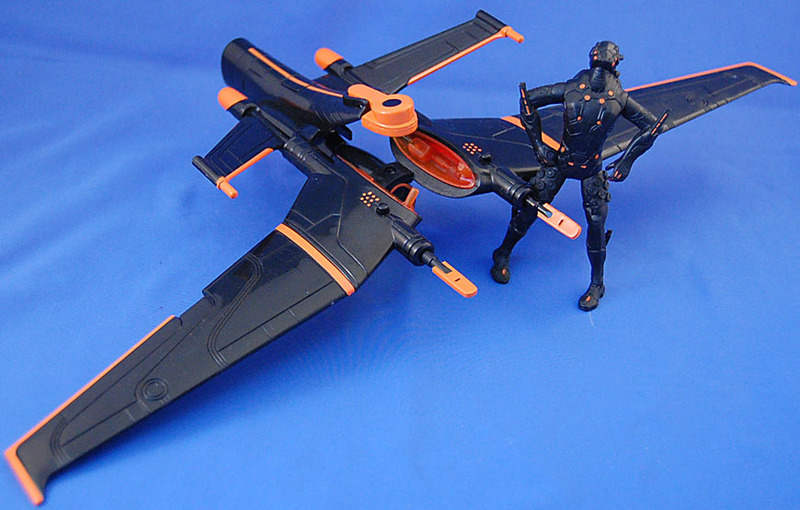 The sculpt of the ship, especially the cockpit, is indredibly well detailed. The two would-be-missiles in the turbines slid out sort of like lances. Its odd, but the budget probably couldn't allow for launcher parts. Anakin reuses his lightsaber and head but the rest is all-new. 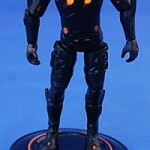 He has T-crotch, swivel waist, balljointed shoulders and elbows, and a ball-and-socket head. Not too bad, all things considered. Found a full set and bought it at Walmart. This purchase is what took the wind out of my sails for the weekend. Mediocre figures at a high price point that I am too compulsively fixtated on the license to pass up. Basically feels like a chore to buy these. I did not open Blackbeard because his face paint isn't very good and for $15 + tax that's unacceptable. Angelica has super articulated arms - balljointed shoulders, swivel biceps, double-hinged elbows and swivel wrists - but little articulation in the legs (T-crotch and swivel knees). I like the addition of articulation to the arms and pulling back on the legs as I tend to pose mainly only in the arms. She comes with the Zombie Gunner BAF's arm. For more, see yo's review. 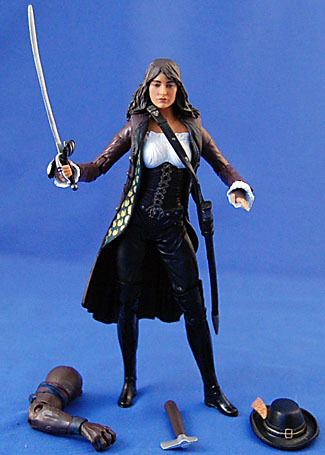 Oh, did I mention that her scabbard is a solid piece and can't hold her sword? The 4" version can, why can't the 7"? This is the only figure of the four I opened that comes close to expectations. Well, I guess Angelica does but I just tend to write off the character. This is because of the neutral pose and decent amount of articulation. 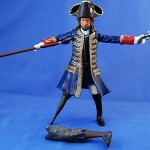 Balljointed shoulders, hinge elbow, swivel wrists, swivel waist, T-crotch and hinged left knee. 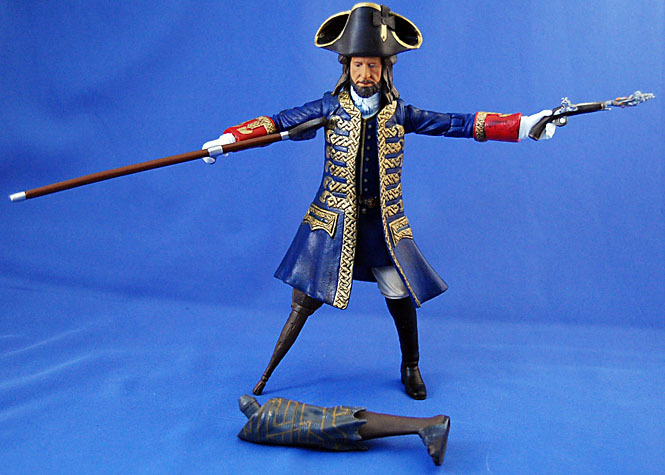 He comes with his crutch and a gun with smoke burst. 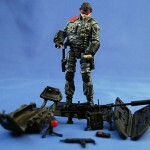 The smoke burst is a neat touch but totally ruins the accessory by rendering useful in only one pose. Were the puff a removable piece, that would be awesome, but as is it's disappointing. 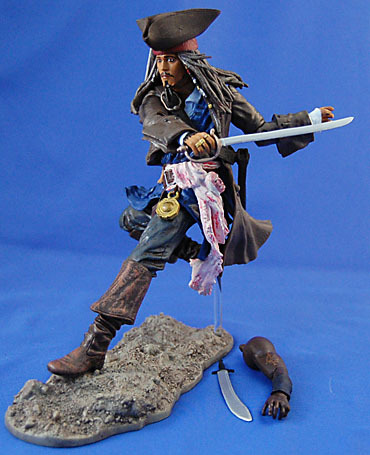 The ridiculous hat is a separate piece but is glued on, and it looks like Barbossa's hair is full sculpted underneath, so WTF Jakks? Make it removable like every other hat in the line. The paint is also the really good, chiefly thanks to a blue wash over the coat and the face being painted rather than plastic. 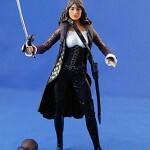 The likeness is remarkably good, but Barbossa's trademarked scurvied skin is noticeably missing - don't know if I wish Jakks matched the movie or the movie matched the toy more. Probably the latter. F**k you, Jakks. I've been waiting since 2003 for for a 7" Gibbs and now that I finally have one not only is sculpted in a fixed pose but he has no articulation!!! Seriously... this was my most anticipated figure in the 7" line, even with the McFarlane Pose, but he is without a doubt the worst figure in the line. Technically there are three points of articulation: swivel wrists, and swivel at the left elbow. Nothing at the neck, and more shocking, nothing at the waist! Seriously... this is a... what the hell guys?! 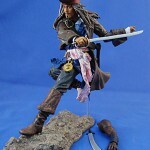 McFarlane almost went out of business doing crap like this and their sculpting and painting is three times better than this. He comes with the BAF's torso and head. Everyone hates this figure but frankly it doesn't bother me too much. 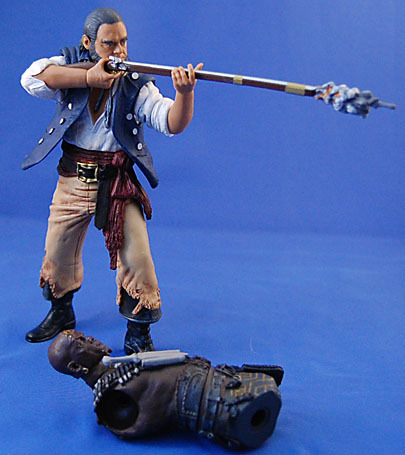 I have something like five or six Jacks in this scale from NECA, another two or three from The Disney Store and one from Disney World, so another standard Jack isn't really high on my priorities. Especially since, come on, they will make one eventually. 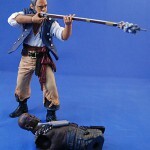 It's a really dynamic pose and sculpt that almost busts through Jakks' general malaise, but suffers a few key setbacks. The secondary coat pieces leaves large openings around the shoulders so the blue under... vest(?) is clearly visible. What's that all about? Just notably bad design. Two, and more substantive, while the arms are articulated they aren't so in a way to really allow for interesting posing. They just hang out in awkward places almost all the time. He also carries over two of the faults from the 4" line: without the hat on, the head looks bulbously out of proportion and the shrunken head on his sash is bright pink. Another more conceptual issue is that while the design and sculpt are very dynamic, Jack is posed in a manner to not allow a good view of figure from any, at least traditional, angles. Any which way you turn him you'll be missing a view of some element you want to be visible. Good effort, Jakks but it's a B. For my money, the best thing Lego ever did was the Mini/Micro Star Wars sets. 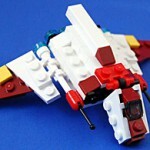 All of the fun of building, all of the fun of play, all of the fun of lego aesthetic/design! When they were discontinued so did the most regular purchasing of Legos I've ever made. Fortunately, though, the format never fully died and now Lego and retailers are realizing the value of these comparably cheap sets and are we're starting to see them once more. 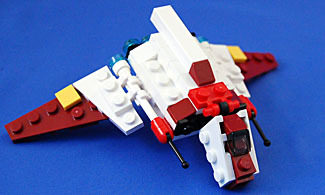 This Shuttle is a TRU exclusive, I believe, and was recently available for $3.99 or free with purchase of over $20 in SW Legos. This is my favorite over the Mini/Micro stuff I've picked up over the last year. Lots of pieces so a decent amount of fun build time, and more little touches than I honestly expected (like articulated wings and five translucent blue engine exhausts). Much like the Shuttle, this was a store-exclusive (this time to Target) and also cost $3.99. These sets come polybagged some with nice graphics and include just the parts and instructions. The idea is that these are essentially "stocking stuffers" so this set is part of Target's Easter (Basket) offerings, so look for it in the seasonal section. This is a pretty fun take on my most hated vehicle from the entire SW "saga." 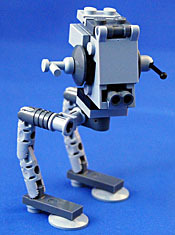 The legs are what you'd expect but the head shows some of that patented Lego creativity we've come to know and love. There are two problems with this set though, the peg attached the head to the legs is pretty loose, causing the head to spin freely, and that connector is too far forward so the thing falls over if the legs are in any orientation other than the one you see here. 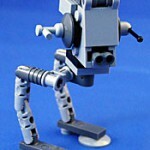 I want to download Lego Designer and create diorama bases for these! I spent some of my leftover C2E2 money on these guys. Normally I hate Megos and their STBLDF knock-offs, but the style and aesthetic of RGB actually works well for me in this format. Mattel has also said they don't plan on doing 6" RGB figures any time soon because the tooling would cost too much (which is B.S. 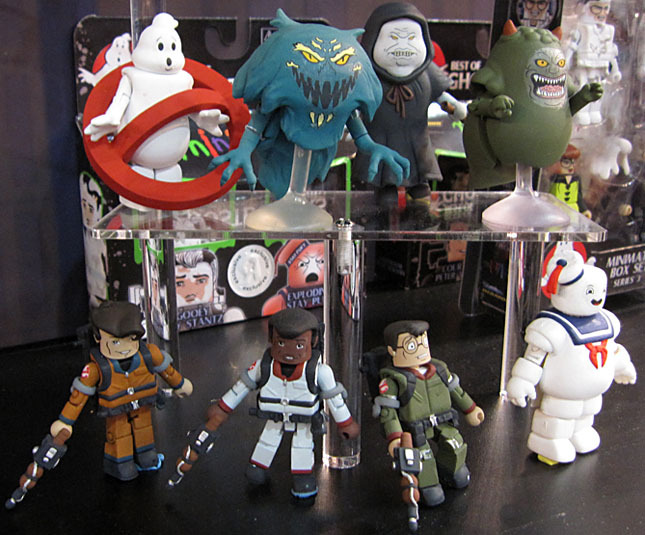 because if we fans are willing to accept all four Ghostbusters with the exact same body then we'd be more than happy to accept that same body repainted with new heads) this is pretty much it for us outside of the awesome upcoming Minimates. Egon's glasses are cast in a soft PVC and are glued in place. They look great and I'm shocked there was no warping. In addition to his Proton Pack he also includes a PKE meter, which looks in style to the show but is off-model to the art on the back of the card. 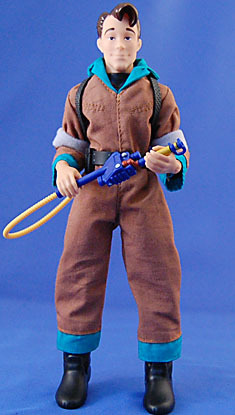 Each figure comes with a second accessory except for ol' Venkman here, so.... thanks. The uniforms are identical across the figure's just made from different colors. There's velcro in the back holding it together, the gray armbands/elbowpads are separate pieces but are sewn into place and there is a GB logo on the shoulders. 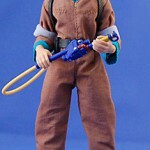 The shoulders of the jumpsuits feel tight across all the figures. I think the measurements are off in the pattern because they don't move naturally during play. The body is a big disappointment to me. No balljoints at the elbows? What the hell!? Getting him to hold the Proton Wand is not easy. Articulation is: swivel neck, ball-and-socket shoulders, hinge elbows, balljointed wrists, balljointed hips, hinge knees, swivel ankles. I was able to get the Mattel-Comp-ed Winston Zeddemore from my dear friend Poe Ghostal, hence you won't be seeing him here and this makes Ray the collection completer. Winston's secondary accessory is the Ghost Trap leaving no real trademark piece left (you could argue "Ray's goggles," but 1) I don't, and 2) few would choose to have him wear the goggles in this display) so Ray gets the pump-sniffer Venkman uses when he goes to Dana's apartment in the first film. Its been a long time since I've seen the show but I'm still skeptical this gadget appeared in it. One of the nice things about the accessories is that they are in four colors, with blue and yellow dominating and black and red as highlights. It's a nice aesthetic keeping in "tone" with the Mego style and reminds me a bit of the old RGB toys even if the coloring isn't accurate to, well, anything. 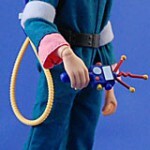 The pump-sniffer can be hung from the shoulder with the pump and sniffer fitting easily into the hands. The Proton Packs are nice too, but a little tricky to get on, but the fight isn't too strenuous. The yellow wire plugs into the back end of the wand, which can be also affixed to the Pack by plugging onto a peg. Target had these guys marked down to $6 so its time to start army- building. For $6 these are great figures, for the original $9, not so much. This guy comes with a stand, light disk and two rods. Its really a shame Spin Master didn't plot out more releases for this line, it's being easy for them and cool for us to get a second version with the freefall wings. Not quite as great as the Black Guard but mainly because there's visible skin and Spin Master is remarkably bad at sculpted and painting human elements. The mouth and chin are just a big blotch of pale skin tone in a thick paint. This whole series has light-up torsos which is a neat gimmick, but had they cut the electronics and used paint (especially UV reactive or metallic paint) the figures would look better, be cheaper and sold more. As is when the LED isn't illuminated the torso is pretty much all black while the limbs have painted lines and when the LED is on, then it's brighter than the limbs' paint which only reminds you they aren't glowing. Basically they don't look great on or off. 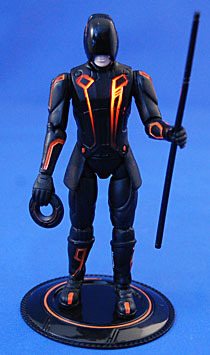 Still though, Tron Legacy was great fun and I'm always happy to add to my collection from it. 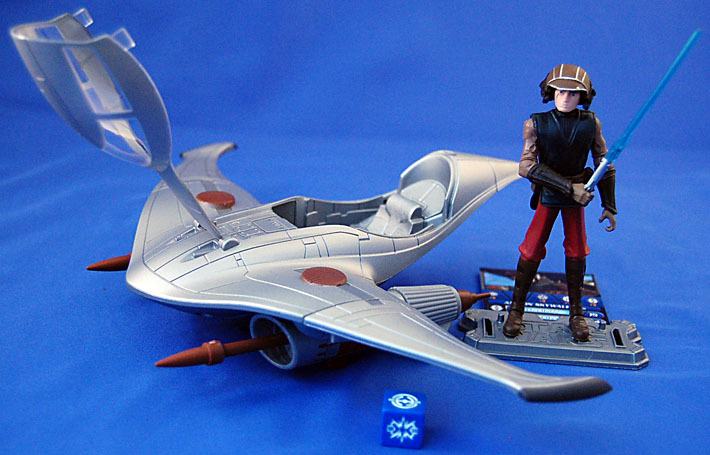 Also marked down (to $10) at Target so I picked up a second to pursue the Three-Man Light Jet. 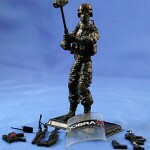 Like most of the other vehicles in this range a "driver" figure is included and is cast in soft PVC. 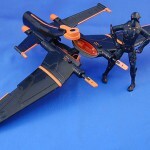 In this case we have the Black Guard with articulation only at the shoulders (swivels) for fitting into the cockpit. Also like the other figures it can be a bit of a struggle getting him in but that's okay cause you're not likely to be removing him a lot. 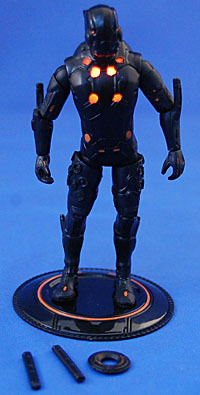 It would have been nice if he had a removable head, like Light Cycle Sam, so it could be swapped out for Rinzler to complete the attack team. On that note it'd be cool to get this with CLU, and speaking of wishes, I wish this thing had a stand! The arm rests in the cockpit and turbine visible on the underside light up, i.e. flash a couple times, when the button on the rear is pushed. Also the missiles launch on the front. This entry was posted in Hasbro, Jakks, Mattel, Rustin's Spoils of the Week and tagged Ghostbusters, GI Joe, PotC, Star Wars, Tron. Bookmark the permalink. Sam looks like he's trying to high-five the arcade machine. 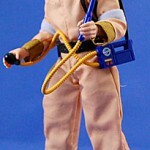 The ghostbuster accessories for whatever reason are based off of the kenner role play scale toys and not the cartoon models. They already turned me off enough by making them megos, but by making the accessories (proton gun as well) inaccurate made them a pass. Also, while I don't like the movie guys sharing a buck they are a lot closer is stature than the cartoon guys. The cartoon was so exaggerated for silhouette purposes that I would be dissapointed in repainted bucks for a 6" line. What a run down! 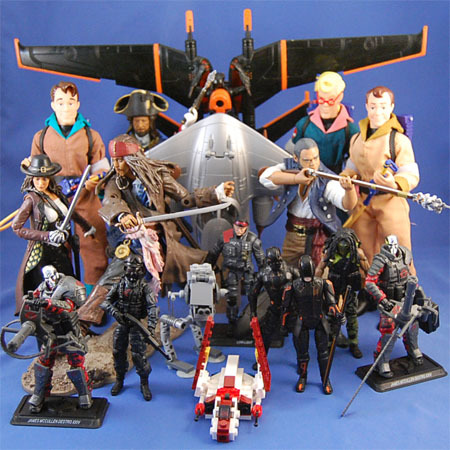 Those GIJoes look sweet but I can't really get behind the around $9 per figure but Hasbro is pretty good with sales so hopefully we'll see that before Easter. I mean the alpha (?) vehicles with a a driver are around $15 which seems like better value. But yeah, I can see the suitcase with dollar stacks being a permenent part of everybody's Joe display from here on out. Everything else you discussed looks like it slots into the "Rustin Taking One for the Team" slot. God bless you! I guess expectations gotta run low when talking about Mattel Megos, Jakks Pacific action figures, and Spin Master action figures. I'm holding out that a company cooler then Mattel (that's not a high barrier to cross) will offer up Filmation's Ghostbusters with Tracey the Gorilla. That would be awesome! I'll check out Jakks 3" line for the kids when they offer a sale up. And I'll take another look at Spin Master mini Tron vehicle offerings as I think those give you the common courtesy of throwing some diecast metal into the mix. So much crap. So little money. 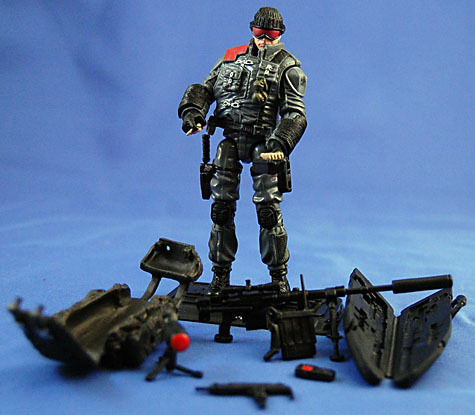 Don't army build that Destro too much. 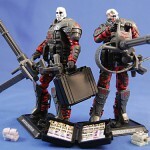 Hasbro is putting out an Iron Grenadier in the next couple months that is basically an IG head on that POC Destro Body for his bodyguards. 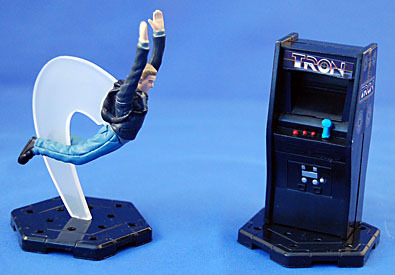 Now's a great time to pick up Tron stuff!!! 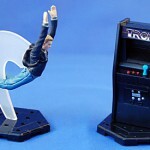 I'd love that Tron Arcade & Sam Flynn pack!